Younger readers can finally get in on the silly zombie goldfish action. This is definitely one for younger readers - not the chapter readers the series usually targets. Finally, younger kiddos can get in on the Big Fat Zombie Goldfish fun, with the release of The Fintastic Fishsitter. For those unfamiliar with the series, the Big Fat Zombie Goldfish books are chapter books for elementary aged kids featuring a young boy and his goldfish, Frankie. After a little incident with an evil scientist older brother, Frankie is now a zombie goldfish with hypnotic powers and a whole lot of adventures. The books are quite popular with the elementary aged set. 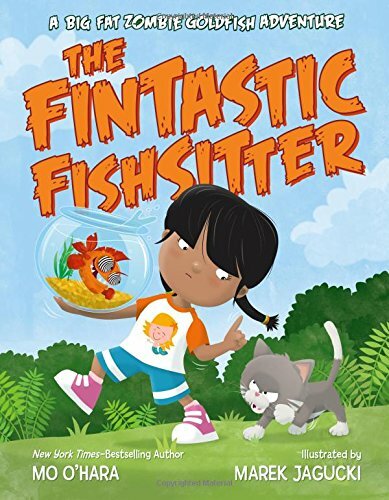 For young readers who aren’t quite ready to tackle chapter books, The Fintastic Fishsitter features an adventure with Frankie in a storybook form, just perfect for a silly bedtime story. When you have a zombie goldfish, finding a petsitter isn’t always easy. When Tom has to go out for awhile, he asks his best friend’s little sister Sami to baby…er fish-sit Frankie. Along with instructions not to get sucked into Frankie’s hypnotic gaze, Tom warns Sami to watch out for Fang – his older brother’s vampire kitten. Once she figures out the specifics of her new job, poor Sami has to figure out how to keep poor Frankie away from Fang’s hungry mouth – and Fang away from Frankie’s zombie powers. It’s not an easy job, but Sami finds a way to keep everyone safe and getting along – well, kind of. 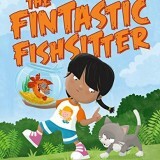 The Fintastic Fishsitter is a fun zombie story that will have young readers giggling instead of shaking in their shoes. Though it features pets with zombie and vampie features, they are silly, colorful, and overall pretty harmless. Each page is filled with full color illustrations that really add to the story, showing the kids the ridiculous situations that arise when one must protect a zombie goldfish from a vampire kitty. The book is a sturdy hardcover that should hold up well to repeated readings – a definite plus, because this is one book your kids are sure to request again and again.